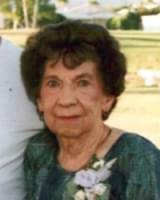 Myrtle Martha Klinger (Little Abba), 95, of Mesa, Arizona passed away on May 25, 2014. Myrtle was born on February 22, 1919 in Carlisle, Pennsylvania. She and her husband, Russell, moved to Arizona in 1966. They became rockhounds and traveled Arizona extensively. She loved her work as a Credit Manager for W.T.Grants, Goodyear Tire and Purcells Tire as she was still employed at age 90. Myrtle took up yoga and ran marathons but her passion was ballroom dancing. There wasn’t much she wouldn’t attempt; like shooting down hornets nest with a shotgun when she was a young lady in Pennsylvania. She was a loving mother and she will be missed by all who knew her. Myrtle is survived by her son, Keith; 2 brothers, James and Ralph Eberly in Pennsylvania; 4 grandchildren, 7 great grandchildren and 1 great great grandchild.